Larry Rice used to be embarrassed. 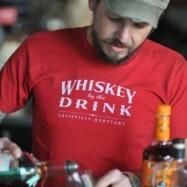 A decade ago, out-of-town guests, eager to sample local bourbons, would visit him in Louisville. But despite the city’s proximity to some of the most famous distilleries, it was hard to find a bar with a great selection of bourbons. Often, they’d have to settle for Tennessee-made Jack Daniel’s. Plenty, it turns out. The establishment offers close to 100 bourbons from 13 different Kentucky distilleries, along with a number of ryes and white dogs. It’s a potent inventory that includes the big boys and boutique producers alike. While Rice says neat pours are popular among the hangout’s bourbon enthusiasts, his craft cocktails, such as the One Horse Cowboy (Wild Turkey 101 Bourbon, Cocchi Americano, Pierre Ferrand Dry Curaçao, grapefruit, lemon, Agent Orange Bitters) and the Honky Tonk (Rittenhouse Bottled-in-Bond Rye Whiskey, brandy, Green Chartreuse, root beer bitters, Angostura Bitters) have also won acclaim. Most of the mixed drinks call for whiskey, tequila or mezcal. There is just one vodka concoction on the menu, a Moscow Mule that’s ironically the bar’s top seller. No matter the base spirit, the secret to The Silver Dollar’s success is that “all of our cocktails are inspired by classic preparations, everything is fresh-juiced and our bitters are homemade,” Rice explains. It doesn’t hurt that it’s intentionally “meant to be lowbrow. We don’t have fancy stemware, there is country-western music playing and our bartenders wear jeans and t-shirts,” he says. The bar’s atmosphere reflects Rice’s own background. He was born in Kentucky and grew up outside ofDallas before moving back to his home state as a teenager and got his start at Tumbleweeds, a Tex-Mex chain “where there was nothing craft going on.” He began as a server, and then when a bartender didn’t show up, the next thing he knew, he was churning out Margaritas and Daiquiris. “I was 21, and in my mind it was a temporary job,” he remembers. “But even as I tried other things, I kept bartending; by the time I got to my 30s I realized it was what I enjoyed most.” For nearly 20 years now, he’s been a fixture on the Louisville bar scene, from slinging drinks at Irish pubs to dreaming up cocktails for the now-shuttered new-American eatery 732 Social. Rice and one of his Silver Dollar partners have recently branched out and opened restaurant El Camino. The surf bar-inspired spot features traditional Mexican street food and delicious rum-centric tiki drinks like the Mai Tai. Don’t worry; there are also creations that call for his beloved bourbon, like the Port Light (Buffalo Trace Bourbon, passion fruit, grenadine, lemon). Rinse the inside of a cocktail glass with the Green Chartreuse, pour off the excess and set the glass aside. Add the remaining ingredients to a mixing glass and fill with ice. Stir, and strain into the prepared glass. Twist a slice of orange peel over the glass and discard. Alia Akkam is a New York-based writer and editor of Edible Queens. The post Raising the Bar: Larry Rice appeared first on The Bourbon Review.